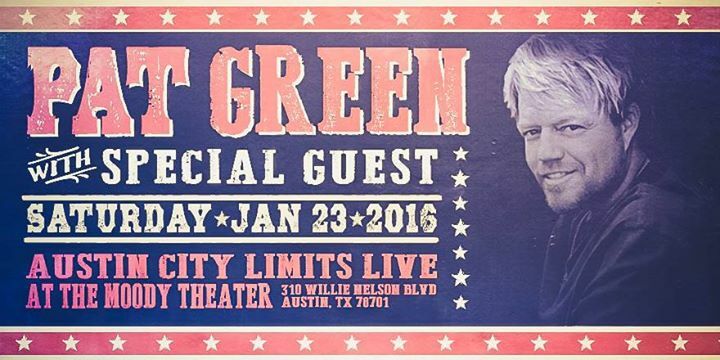 Pat Green has finally come full circle — and all the way back Home. After rising through Texas’ college-town and dancehall scene years ago, Green earned himself major-label support in Nashville and became the poster child of Texas music for a whole generation of fans. His list of achievements includes over 2 million albums sold, three Grammy nominations and a sold out Houston Astrodome. But after releasing six albums in eight years, sending singles like “Wave on Wave” and “Let Me” up the charts, touring with powerhouses like Kenny Chesney and Keith Urban and dealing with accusations of “selling out,” the meat grinder of mainstream stardom proved to be too much. He was spent. “I’m very comfortable with this record, it came out exactly as I wanted it,” Green says. Produced by the all-star team of Jon Randall Stewart, Justin Pollard and Gary Paczosa, the album captures some of the unbridled energy of his first three self-released projects. The album begins with the title track, boldly tackling the singer’s contentious mainstream rise and any lingering naysayers right off the bat. Green doesn’t regret taking his shot at the big time — and says he had a lot of fun doing it — but he does understand why some fans felt left out in the cold. The album’s first single, “Girls From Texas,” is a prime example, and also features the first of Home’s stellar guest appearances. A sugary, grown-up lullaby that explains why Texan girls are just a little bit better than the rest, the track spent 10 weeks on top of the Texas Music chart. Green calls recording the song face-to-face with Lyle Lovett a highlight of the whole project. “While I Was Away,” the project’s second single, will strike a chord with anyone who leaves his or her family behind to travel for work. Written by Zane Williams, it’s a tearjerker of the highest caliber — one that even Green has trouble getting through. For lighter fare, Delbert McClinton and Lee Roy Parnell guest on “May the Good Times Never End.” With a twisting, generation-spanning storyline, it features a hotrod beat and Parnell’s burning slide guitar, as well as McClinton’ rabble-rousing vocals and harmonica. “Break It Back Down” speaks to Green’s new outlook on life and music, while “No One Here But Us” brings in Sarah Buxton to tell a steamy tale of desperate romance. Meanwhile, “Right Now” is a broken-hearted duet with Sheryl Crow that tells the unflattering-but-true story of Green dumping his now-wife on Valentine’s Day. And finally, “Good Night In New Orleans” ends the project on a high note, featuring a celebratory storyline and Louisiana-native Marc Broussard for added Cajun authenticity. Mainstream country may have changed, but Green is back in his groove, back to loving and making music on his own terms and happier than ever. And that’s a recipe for a comeback of epic proportions.